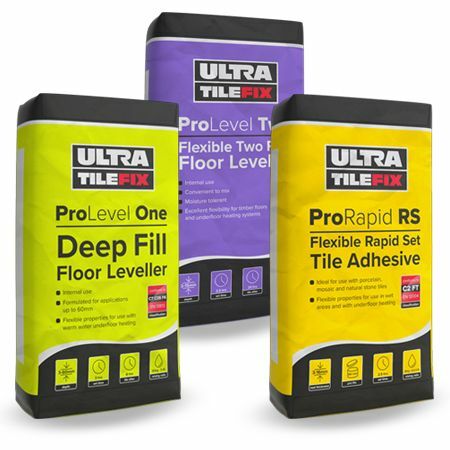 A superior range of Levelling Compounds, Adhesives and Grouts designed for use with Underfloor Heating. Guaranteed compatible with our under tile heating systems and insulation boards. Only available when purchasing underfloor heating. Level IT one HDB is a single part cementitious floor leveller, containing a blend of specially graded fillers, fine cements and polymers for smoothing and levelling internal floors with irregular substrates. Open time 20-30 minutes, Set time 3 hours. Fastset flexible adhesive ProRapid RS. Covers 5m2 when installing insulation boards. Covers 2.5m2 per bag over underfloor heating.